Chris Pine is facing tough competition for his role as head honcho of the USS Enterprise. The actor, who reprises his role as Captain Kirk in “Star Trek Beyond,” battles over control of the Starship Enterprise bridge with newcomer to the franchise, Idris Elba, in a video to promote Omaze’s charitable campaign. “There is still time for you to win a walk-on role in the new movie,” Pine tells viewers in a YouTube video released Thursday. However, he has to fight for airtime with Elba, who keeps speaking over him. “The yellow lines are you — the white lines are me,” the “Luther” actor corrects his American co-host condescendingly. “I can not believe you are still talking,” Pine mumbles as Elba attempts to steal the show with his proper British accent. “Not to blow the plot, but I am the new Captain Kirk,” Elba claims, as he shoves Pine out of the way. In fact, Elba will be playing a villain in “Star Trek 3,” directed by Justin Lin, but few details have been revealed about his character. The “Star Trek: To Boldly Go” Omaze campaign gives fans the chance to win a walk-on role in “Star Trek Beyond.” By contributing $10 or more, supporters will be entered to win this once-in-a-lifetime experience while benefitting selected charities including Make A Wish and Heaven Homes. “Star Trek 3” is produced by Bad Robot’s J.J. Abrams and Bryan Burk as well as Orci, while Skydance’s David Ellison and Dana Goldberg executive produce. Zachary Quinto (as Spock), Zoe Saldana (as Uhura) and Simon Pegg (as Scotty) are all also returning for the third installment. “Star Trek Beyond” will hit theaters on July 8, 2016. 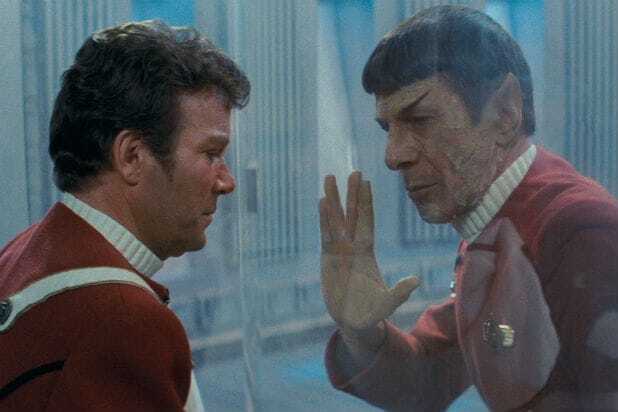 "The needs of the many outweigh the needs of the few" - "Star Trek II: The Wrath of Khan"
“Interesting. You Earth people glorify organized violence for 40 centuries, but you imprison those who employ it privately” - "Star Trek: Dagger of the Mind"
"Insufficient facts always invite danger" - "Star Trek: Space Seed"
"It is curious how often you humans manage to obtain that which you do not want" - "Star Trek: Errand of Mercy"
"Space still contains infinite unknowns" - "Star Trek: The Naked Time"
"I have never understood the female capacity to avoid a direct answer to any question" - "Star Trek: This Side of Paradise"